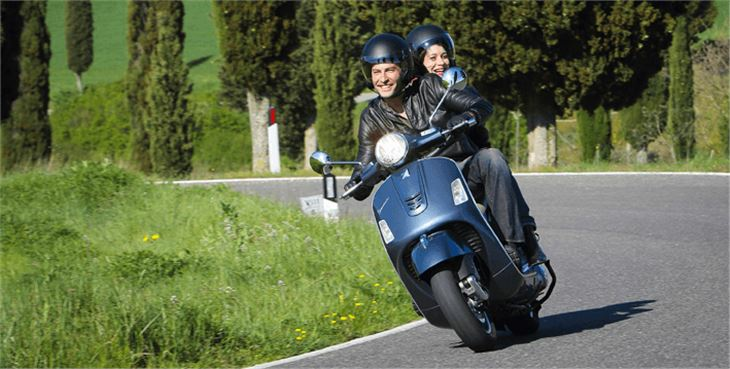 More than any other scooter, Vespas sell to many who have no other interest in two-wheelers beyond the looks and style on offer. 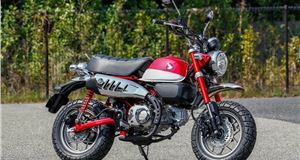 It explains why the 50- and 125cc models are longstanding big sellers as they are exactly what many new riders think of when they imagine themselves sat on a scooter. Yet, here we have the bigger-motored GTS 300 model that counts among the top-selling machines in its class in the UK. 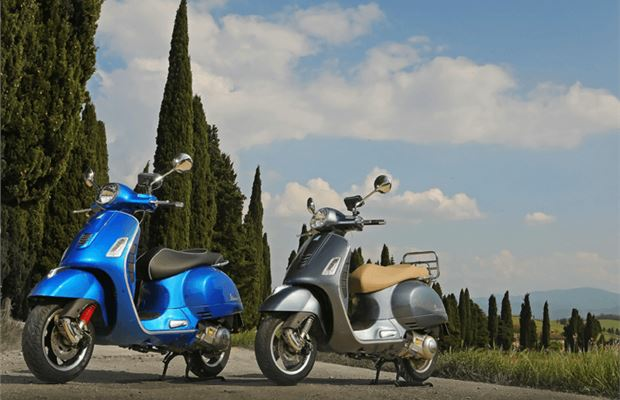 Given you need an A2 or full A licence to ride the Vespa GTS 300, there must be more to it than skin deep appearances. Otherwise, many riders would bypass this Italian icon and head for more overtly practical maxi scooters or a motorcycle. So, what’s the secret of this bike’s success? Well, you only have to look at the Vespa to want to sling your leg through the front and head off along the Amalfi coast. It’s that kind of sentimental throw-back feel that has kept Vespa selling scooters, so much so that it’s original looks have gone from being dated to become retro chic. Think of it as the two-wheeled equivalent of the modern MINI or Fiat 500 and you’re on the money. Speaking of cash, the Vespa GTS 300 rings the till at £4899, which is a lot of dough for something looks, well, a bit basic. 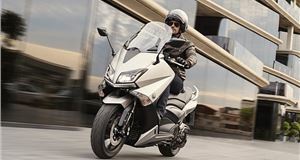 Compare it to the Honda SH300i or similarly performing Suzuki Burgman 200 and the Vespa is pricier. Some of the cost is offset by the GTS 300’s strong residual values, so you won’t lose much when you come to sell. The rest is justified in a number of ways, including the quality of construction and the way it rides. From running your hand over the bodywork to peering into the inner recesses of the engine, what you find is a level of build and attention to detail that most other scooters don’t come close to. This is part of the reason buyers are happy to spend on the Vespa, and it also means the bike stands up well to year-round use and living outside on the street. And now we know it’s screwed together properly, what’s it like to ride? In a nutshell, it’s just as good from the saddle as it is to look at. However, that doesn’t mean you have to put up with an old-fashioned or retro experience. Far from it. The GTS 300 has one of the cushiest rides you’ll find on a scooter of this size or price, and it’s better than many more pricey alternatives too. Years of refining its offering has resulted in the Vespa not just coping with bumps but dealing with them in a controlled, composed and stately manner. 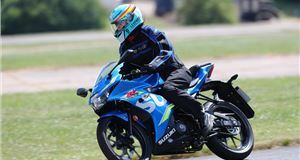 In higher speed corners, you can feel the rear wheel moving about due to the weight of the engine attached to the swing arm, but it’s much better than most of the competition. 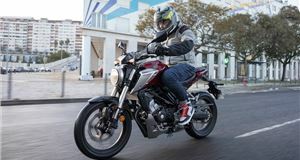 With the latest GTS 300, you get ASR anti-skid regulation control, so any movement at the rear tyre is quickly and effectively quelled long before it becomes a concern for the rider. We noticed it coming into play a couple of times and, while more experienced riders might find it a little too quick to intervene, there’s no doubt this system could save you from a spill on a wet roundabout spattered in diesel. You also have ABS anti-lock brakes as standard on the GTS 300, which further go towards justifying the price of this Vespa. With discs front and rear, you have lots of stopping power and the confidence to use it. As for handling, the GTS 300 is light on its toes thanks to 12-inch wheels that let you jink and dodge through built-up traffic easily. When the road clears, the Vespa remains a stable platform on which to conduct your journey whether it’s solo or with a pillion sat on the reasonably padded seat. The passenger gets fold-out foot pegs on the 300, but you might want to consider opting for a top box to give some added support at the back. This will also be useful for storing your helmet as the underseat cubby is tight even for an open-face lid. One- or two-up, the GTS 300’s engine never has to struggle. 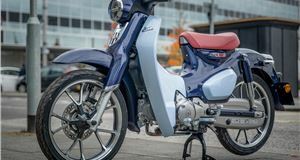 This latest EU4 emissions-compliant motor pulls strongly as soon as you twist the throttle and takes the scooter up to 30, 40, 50 and 60mph limits briskly. Head on to 70mph and the 300 continues to work unchallenged and we saw an indicated 80mph on the analogue speedometer. At these higher velocities, you’ll want the optional front screen that also does a good job of fending off the rain and road muck from vehicles in front. With a slightly more conservative approach to pace and throttle use, Vespa reckons you can get a combined fuel economy of 85.0mpg. During our time on the GTS 300, that was nearer 70mpg, but it’s still good for a scooter of this performance and capacity. With an 8.5-litre tank, you should also steer clear of petrol stations for prolonged periods. 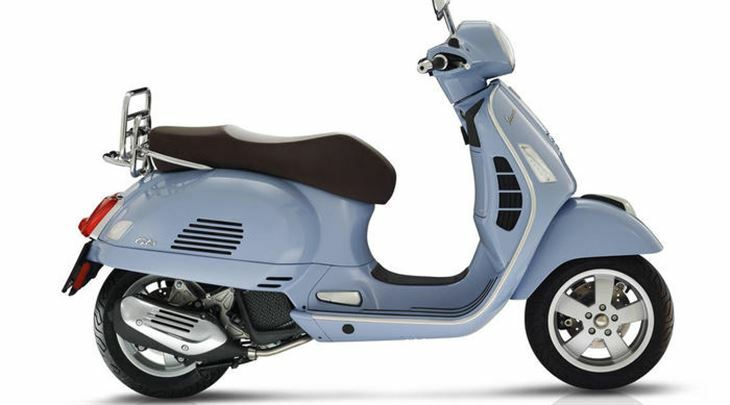 The only problem you might have there is the Vespa GTS 300 is huge fun to ride, so you might well count up the miles more quickly than you planned. That’s a big endorsement of this scooter and proves its attraction goes much, much further than just looks alone. Top speed mph 73mph. Fuel consumption 85.0mpg (claimed). VED £41.